Anglo-Saxons call it burger, but we call steak haché! It is in fact a steak made out of mince beef. Season the mince beef with a pinch of salt and pepper, half of the chopped onion and half of the garlic. Mix well and form a nice round burger (no eggs or bread crumbs needed). In a frying pan, heat up 1tbsp of olive oil. Place the steak in the pan and fry each side on high heat for 3 minutes. Once the steak is cooked. Remove it from the pan, add another spoon of olive oil, then throw in, the chopped sweet red pepper, the chilli, tomato, rest of garlic and chopped onions. Add salt and pepper. Not too much salt as it might reduce the sweetness of the tomato and sweet peppers. Stir-fry the mix for 3-4 minutes and remove from heat. Place the steak on top of the stir-fry and cover while you are getting the French fries ready. This will keep the meat and accompaniment moist and warm until you are ready to serve. You know how to cook fries right? If you are reading this, you know how you like your potato fries. My steak was served with a mix of French fries and potato wedges…AND MAYONAISE. You may have noticed by now, I love Mayonnaise and Garlic!!! What do you want? I am French. Deal with it. The little stir-fry will bring all the moisture needed in this dish. I recommend that you make your own steak haché as you will know exactly with is in it. Mince steak doesn’t need bread crumbs and eggs. It just need handling carefully. 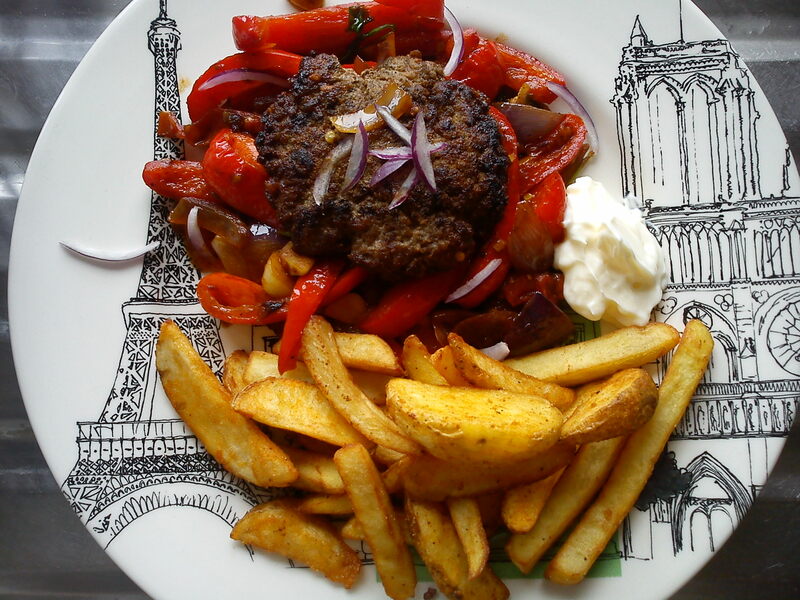 This entry was posted in Main meals and tagged Beef, chilli, Garlic, mayonnaise, Onion, Steak. Bookmark the permalink.